Western Mass. Medicare for All encourages the formation of groups called “hubs” and supports them in their work. 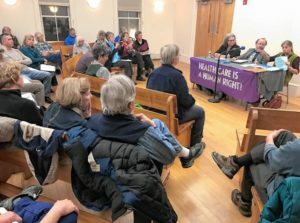 These groups are ‘hubs of single-payer activity’ in different towns and cities across the region. Often hubs form as a committee or task force within a larger multi-issue organization. In order to demonstrate widespread voter support for Single Payer in Mass., our hubs gathered signatures to place a non-binding question on the November ballot in six legislative districts. For several months, WMM4A advocates formed visibility teams to spread the word, handed out literature, organized educational events, spoke on ballot forums, held signs, placed radio spots, wrote press releases, and canvassed neighborhoods. Single Payer won big on Election Day! The ballot question passed with an overall YES vote of 77%, winning in every single town and city in which it appeared! 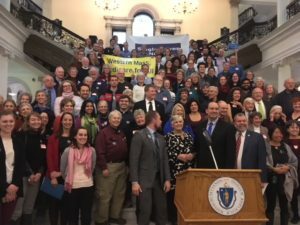 This victory is another step toward building a powerful regional and statewide movement for Single Payer in Mass. Hubs were also active throughout the election season keeping Medicare for All on the radar and in the media – tabling at electoral events, raising questions about Single Payer at candidate forums, distributing literature, organizing standouts and holding signs at the polls on Election Day. Hosted educational speakers and panels, and showings of the movies, Fix It and Now Is the Time. meetings in Franklin County, and the City Council in Northampton. Calculated savings for cities and towns under the proposed legislation. Tabled at farmers’ markets – talked with neighbors, distributed literature, and signed folks up for our listserv. Lobby Day at the Boston statehouse. Lobbied state legislators individually and in group delegations and at a Lobby Day event in Boston in November. Participated in public demonstrations to defend the Affordable Care Act and promote Medicare for All, and to stand up for racial justice.